In order to construct this logic model, we have to take two steps. Firstly, we need to identify the conceptual relationship between objects and actualities. Secondly, we need to express these concepts in our ordinary language. With these two steps, we can show how we can use language to describe the manifestations of Tao. First, we need aninteraction model to show how the two interacting objects can participate in forming the actualities. The objects will intermix in the actualities. As a result, there will be some Yu mixed with Wu to form Heng Wu, and some Wu mixed with Yu to form Heng Yu. The objects are superimposed or entangled within an actuality. This sub-model establishes the conceptual relationship between the objects and the actualities. Next, we need a linguistic model to express our conceptsin terms of our ordinary language. In a logical system, all concepts must be expressed in language. This sub-model will show that our linguistic description of Tao will be“vague, self-contradictory, and indeterminate.” However, such words used by Lao-tzu actually follow a clear logic. 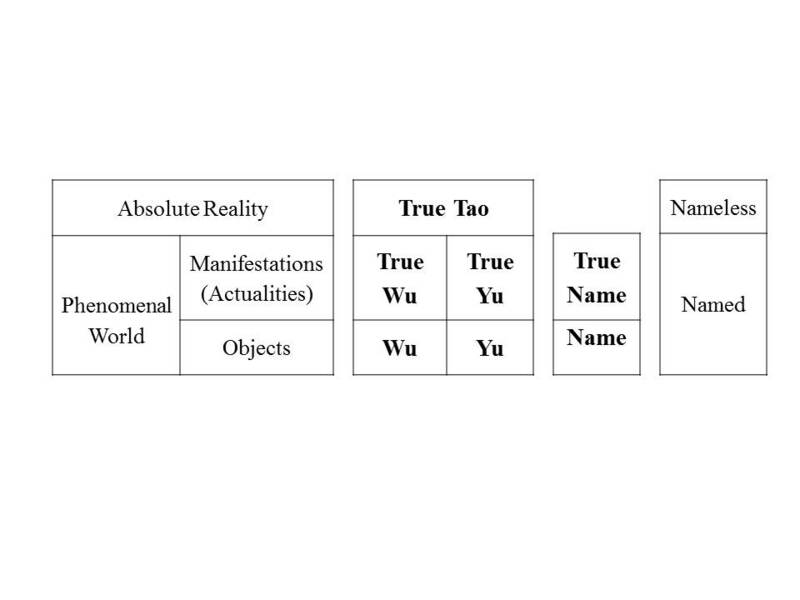 With these two sub-models, we can construct a systematic model for the Logic of Tao philosophy. The interaction model is a very general interaction model. The linguistic model is a heuristic formulation to show the relation between thought and our language. As we shall see in our final model, asimple systematic model can describe a very complicated logic structure used by Lao-tzu.With this logic model, we can understand why the words of Lao-tzu must be vague, self-contradictory, and indeterminate, in order to describe the manifestations of Tao. For the same reason, we are assured again that we can seek to understand the principle of Tao behind the paradoxical words of Lao-tzu.